Fort Myers Brewing Company, which just celebrated its sixth anniversary, won two prestigious medals at the Best Florida Beer Competition in Tampa. The local brewer took home the gold medal for its classic Sand Loafer in the Wheat-Rye Beer category and bronze for its flavorful chocolate stout Somebody Else’s Dream in the Coffee/Chocolate Beer category. The Best Florida Beer Competition is a sanctioned beer, mead and cider championship for professional brewers. It’s sponsored by Best Florida Beer, a nonprofit organization that aids in the development and promotion of both home and commercial Florida brewers, craft beers and the community of brewing enthusiasts. The 2019 competition drew 824 entries from 136 craft brewers across Florida. Awards were presented March 3 at the Brewers Ball in Tampa. Fort Myers Brewing won the title of “Best Large Brewery in Florida” at the 2016 competition. 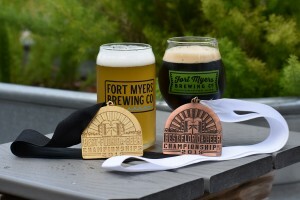 Since the brewery was established, Fort Myers Brewing has earned eight golds, five silvers and eight bronzes at the Best Florida Beer Competition. Established in 2013, Fort Myers Brewing Company was the first microbrewery to open in Lee County and continues to lead Southwest Florida’s surging craft beer movement. Founded by Rob Whyte and Jen Gratz-Whyte, Fort Myers Brewing carries a signature line of flagship beers in addition to seasonal brews and small batch specialties. Its ales, pilsners, stouts and IPAs are winners of multiple prestigious awards, including golds at the Best Florida Beer Competition and a silver at the 2018 World Beer Cup. Fort Myers Brewing was named “Best Large Brewery in Florida” in 2016. The brewery is located at 12811 Commerce Lakes Drive, Suite 28, in Fort Myers. For more information, visit FMbrew.com or call 239-313-6576.